Watermelons were thought to have originated in the Kalahari Desert of Africa and are now produced throughout the world, including in 44 U.S. states. According to the United States Department of Agriculture, in addition to containing plentiful amounts of the health-promoting antioxidant lycopene, watermelon is an excellent source of the amino acid citrulline, which is necessary for cell division and wound healing. Watermelon is naturally low in fat, cholesterol and calories and rich in vitamins making it a delicious heart-healthy snack. Watermelon is an excellent source of vitamin A with one wedge of the fruit containing 33 percent of the daily value. Vitamin A is a fat-soluble vitamin needed for the formation and maintenance of your mucous membranes, skin and bone. One wedge of watermelon contains only 1 percent of the daily value of the antioxidant vitamin E. Antioxidant are substances that protect your cells against the effects of free radicals, which can damage the cells of your body. Vitamin C is a water-soluble vitamin required for collagen synthesis and also acts as a beneficial antioxidant, protecting your body tissues against oxidation. One wedge of watermelon contains 39 percent of the daily recommended value of the vitamin. One wedge of watermelon contains 6 percent of the daily value of thiamin, or vitamin B1. This is a water-soluble vitamin required for the growth and maintenance of nerve and muscle tissues. 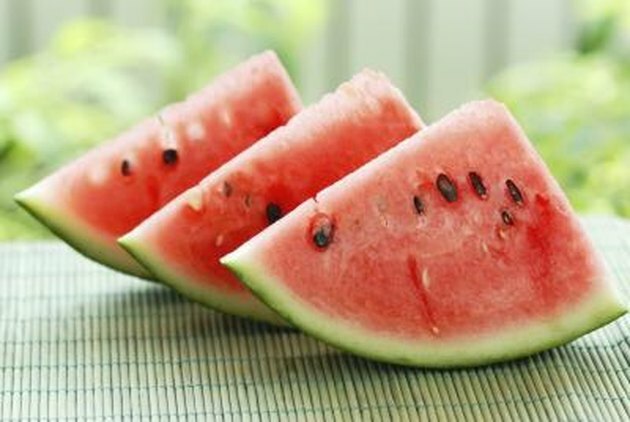 Riboflavin, another B vitamin, is also found in watermelon. This vitamin promotes growth and tissue repair and also assists in the function of cell division. Four percent of the daily value of riboflavin is found in one wedge of watermelon. One serving of watermelon consists of 3 percent of the daily value of niacin, which is a water-soluble B vitamin that helps maintain normal nervous system functions. Vitamin B6 is required for normal red blood cell formation as well as the formation of lipids in your nervous and immune systems. One wedge of watermelon contains 6 percent of the daily value of the vitamin. The folate, or folic acid, found in one serving of watermelon makes up 2 percent of the daily value. Folate is necessary for the production and maintenance of new cells and is required for the formation of DNA. Six percent of the daily value of pantothenic acid is found in one wedge of watermelon. This vitamin assists in the breakdown of fats, carbohydrates and proteins.